FOOD is a key factor of every event. It is a great conversation-starter and forms an essential part of the delegate experience. In some instances, it can also serve as a medium for event organisers to tell stories that align with their corporate values – especially in the area of sustainability. That was the case for two recent events held at Marina Bay Sands: the Schneider Electric Global Innovation Summit (20-21 September), as well as the 7thResponsible Business Forum on Sustainable Development (RBF) (11-12 October), organised by Global Initiatives (GI) in collaboration with the United Nations Environment Programme (UNEP). For Schneider and GI, both of which operate with sustainability at the core of their businesses, green meetings were a standard. This made Marina Bay Sands in Singapore the ideal partner for their events. As a leader in sustainability, the integrated resort shares the same vision as these like-minded clients. For the first time, Marina Bay Sands went the extra mile to raise the bar in sustainable food storytelling with specially created ‘Earth-friendly’ menus for both events. Going beyond its usual green meeting Harvest Menu, which offers locally sourced food and beverage options to reduce Food Miles, Marina Bay Sands conceptualised a menu made with a higher volume of certified environmentally-friendly products. The six-month long collaborative process between Marina Bay Sands and Schneider resulted in a fully sustainable menu featuring Organic, Fair Trade- or Rainforest Alliance Certified, responsibly produced or locally sourced ingredients. Marina Bay Sands’ Earth-friendly menu made its debut during the Schneider Electric Global Innovation Summit Singapore, which took place at Sands Expo and Convention Centre last month. Highlights of the menu include certified items such as such as Rainforest Alliance Certified coffee, one of the world’s most sustainable rice certified by The Sustainable Rice Platform convened by UN Environment and the International Rice Research Institute (IRRI), as well as other organic products such as meat, wine, butter, eggs and vegetables. More significantly, it also offers dishes made with 100 per cent responsibly-sourced seafood ingredients such as prawns, barramundi and red snapper, in line with Marina Bay Sands’ commitment to responsible seafood. Over 10,400 earth-friendly meals were served over the two-day event, which included an Innovation Summit Dinner for 1,000 delegates on the first day. A similar Earth-friendly menu was also presented during RBF 2018, which returned to Marina Bay Sands for the sixth year on 11 and 12 October. The RBF menu placed a greater emphasis on local and regional sourcing as the integrated resort made a deliberate effort to include products sourced from farms in Singapore and nearby countries to minimise Food Miles. Ian Wilson, Marina Bay Sands’ Senior Vice President of Non-Gaming Operations, delivered a welcome address highlighting the event’s special Earth-Friendly Menu during RBF 2018. 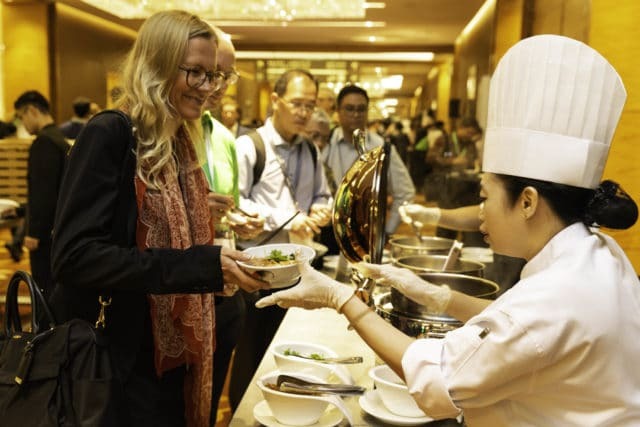 During the two-day conference, over 800 RBF delegates were treated to special creations such as Cauliflower Soup with Goat’s Milk produced by Hay Dairies Goat Farm in Singapore, as well as pancakes served with innovative local jams in flavours such as Tropical Calamansi and Singapore Sling by local producer Straits Preserves. Beyond the food, Marina Bay Sands worked hand-in-hand with both organisers to consciously minimise the events’ overall environmental impact through initiatives such as recycling lanyards and eliminating single-use event material such as straws, plastic bottles, coffee stirrers and takeaway coffee cups, where possible. As a company that has established roots in the local community through its extensive CSR initiatives, Marina Bay Sands was also able to tap on its network of charities to help Schneider channel their leftover event furniture towards a charitable cause. The integrated resort connected the organiser with the Association for Persons with Special Needs (APSN) and facilitated the donation of 320 furniture items such as shelves, sofas and tables to the organisation. These furniture items were used to furnish APSN’s new Centre for Adults, a sheltered workshop and training centre space for its beneficiaries. For Schneider, the event’s sustainable elements naturally aligned with the company’s Green Meetings Initiative – a set of guidelines and action plans that are always shared with Schneider’s event partners across the globe.